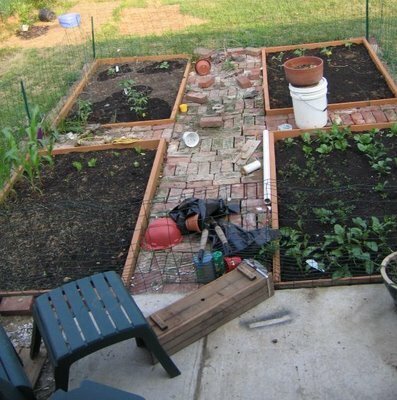 This was my garden in 2008. I think each bed was about 4' x 6'. 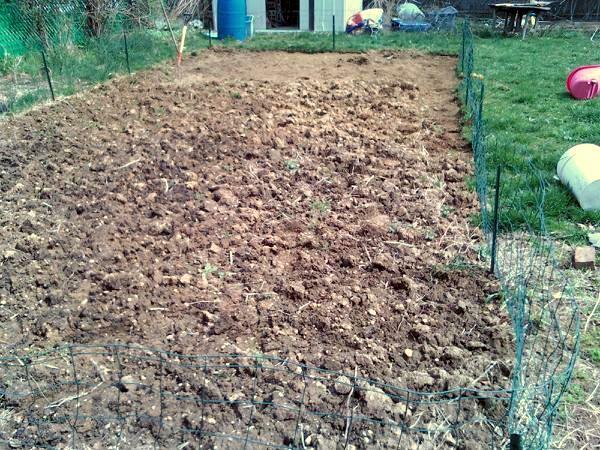 The following year I expanded it by two more 4' x 6' beds. In 2010, the Boyfriend helped me expand it to about 15' x 25'...give or take. And this is it as of today. The Boyfriend just emailed me a pic while I was in school. He finished cutting out the sod and is about to turn it over. It is now around 500 square feet...about 16 x 32. I think this will be the last of our expansion. We also have two 2' x 8' beds on the side of the house. One for the asparagus, the other for strawberries. One has a trellis for my peas. I also have a couple of large containers I previously used for beets and carrots, but I think the potatoes will go in them this year.